Bally "Bilbao" Oxford Dress Shoes. Perforated Toe. Oxblood Brown. Made In Italy. Shoe Tress Not Included. Bottom Sole Length - 11.75". Semi Brogue Cap Toe Dress Oxford Shoes. Missing Insoles, Toe Boxes Show Wear. Gently used. Slight wear to heels and a little stretching around ankle area. Upper suede areas are in excellent condition. Beautiful Allen Edmonds Lexington wingtip shoe. L eather upper in great shape. Small hole in the upper sole of the right shoe. Needs res oling. See picture for details. Bottoms are slightly dirty, tread is not worn down or uneven. Length (heel to toe)-11.75". Insoles-11.25". Width-4.5". minnetonka moccasins mens 10 Narrow Camp Mocs Boat Shoes. Condition is Pre-owned. Shipped with USPS Priority Mail. Very good condition, beautiful leather campmocs. Narrow size 10. Barely worn, sole has little to no wear. Men's Bragano by Cole Haan Made in Italy Size Sz 11 N Brown Weave Leather Tasseled Dress Shoes Style 4339. Condition is Pre-owned, see pictures. Noted heel wear on both shoes and some softness to both soles in forefoot area, uppers are in Excellent shape. Shipped with USPS Priority Mail. 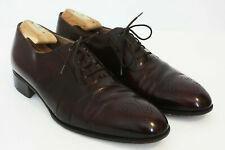 Florsheim Men's Vintage Lace Up Leather Oxford Dress Shoes Burgundy Size 8 C. Shipped with USPS Priority Mail. Bottoms of the shoes are very dirty and worn. Insoles of the shoes have heavy wear and dirt. Outsides of the shoes have wear and dirt. Length (heel to toe)- 12". FRYE DOUBLE MONK STRAP LOAFERS SHOES BROWN LEATHER CAP TOE MENS SIZE 8.5 B. Condition is Pre-owned. Shipped with USPS Priority Mail. PLEASE REVIEW ALL PHOTOS AND FEEL FREE TO ASK ANY QUESTIONS. CONDITION: Pre-owned; There is one large scratch and one small scratch on the left shoes. We have included pictures to assess the condition before purchasing. NO VARIANTS! pictures of actual item(s) you will receive! DON’T MISS OUT TO ADD TO YOUR COLLECTION. These shoes are in great used condition. 100% AUTHENTIC MOST TRUSTED SELLER BRAND NEW SHIPS NOW! Saddle Stitching. Leather Uppers & Soles. Genuine handsewn moccasin. - leather upper. Allen Edmonds. Get a great deal on these shoes! Lots of life left in this unique pair of dress shoes. See photos! See the item condition section for complete details about the condition of the item. Bostonian Classics. Shoes are in good condition - light Wear.